The Pho Tom Satee ($6) at Xe Lua isn’t the prettiest thing to look at, but it’s got soul; deep and complex. The soup, made with Vietnamese satee sauce (a bright, spicy blend of chili peppers, lemongrass, and fish sauce), is full of flavor; salty, sweet, sour, and spicy, all at the same time. 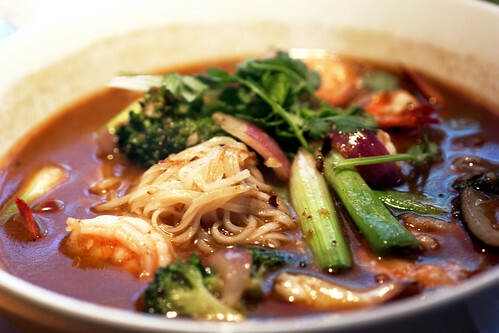 Swimming in the fragrant, sauce-thickened soup is rice noodles, lots of medium-size shrimp (seven on my last visit), broccoli, shallots, scallions, and cilantro. The Pho Tom Satee has everything in it except the kitchen sink, but in case you feel it doesn’t have enough stuff, it comes with the ubiquitous pho garnishes: mung bean sprouts, culantro, Thai basil, lime, and jalapeno slices. Squeeze the lime and throw everything else in. The soup is on the salty side so the sprouts and the herbs help take off the edge. And although there’s some heat in the soup from the satee sauce, I like the fresh spiciness from the jalapeno. Usually, I’ll add a squirt of chili garlic sauce too. I like my hot foods hot. Follow my lead if you dare. The regular pho is better elsewhere, but Xe Lua is worth a visit for the Pho Tom Satee. If anything, it’ll get you out of your pho rut. wow, that broth looks ridiculous. never seen pho like before. it’s funny because a few days ago someone told me not to go to Xe Lua. haha. that looks too good to pass up though! @Danny – I only go there for the Pho Tom Satee. Had some of the other kinds of pho and they were just average. Go for the Pho Tom Satee. The others I can’t recommend. I see red onions, fancy! @someguy – I think they were shallots. Fancier? @Nicholas – That’s my job! Counting the shrimp that is, not killing you. WOOOO, yes fancier! Glad you counted the shrimps, great bang for your buck.